I want to invite everyone to an exciting event on Wednesday, October 19th just up the road in Clarkston, Michigan. 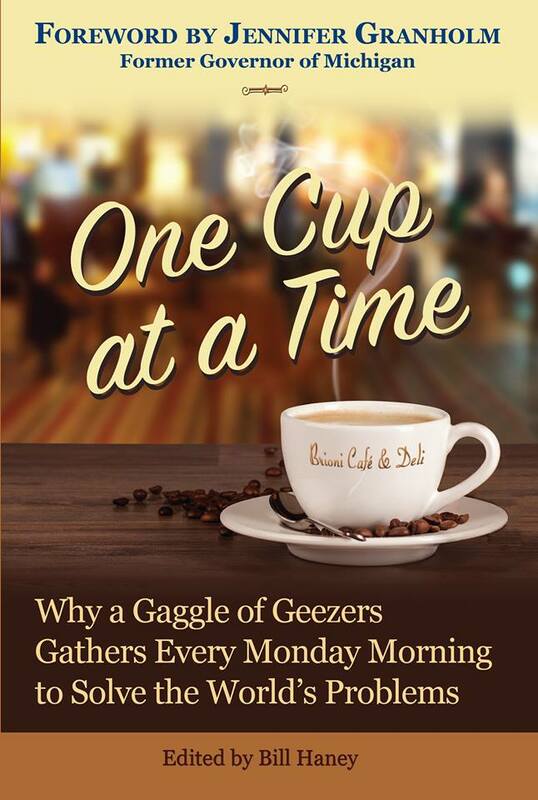 The occasion is the launch of a fascinating book with a title that is especially makes me smile: ONE CUP AT A TIME: Why a Gaggle of Geezers Gathers Every Monday Morning to Solve the World’s Problems. 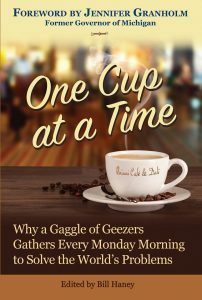 The title itself speaks of a natural alliance to this great read, where people are talking about solving the world’s problems while drinking an invigorating cup of coffee. I’m gratified that it’s over a cup of any Detroit Bold variety. So that’s where I’ll be, as my dear friend and longtime author and publicist, Bill Haney and company sign 1st edition copies of this great collaboration. “Anyone seeking inspiring stories of the strength and durability of the human spirit need look no further than the pages of this book for convincing proof that you don’t have to be a prominent public figure to make a difference… how they prevailed and brought up their own children into better conditions than they themselves enjoyed are stories worth reading. Here are real-life examples of the resiliency of the human spirit. The event will also raise meaningful funds to support the efforts of Reading Works – Detroit, a vital program promoting adult literacy in Michigan men and women, so crucial to families and our communities. The authors and the publisher are donating proceeds to Reading Works from the $29.95 hardcover, signed, limited first edition. The book has many intriguing, never-told-before stories and will make a unique gift for your friends. The event will be at Deer Lake Athletic Club, 6167 White Lake Road, Village of Clarkston, MI 48346, October 19, from 7 to 8:30 p.m.